UAEL (United Association of Equipment Leasing), Silicon Valley,Ca. It meant a lot to me to receive the Salvation Army "Others" Award. It is a high honor. I have been awarded the San Francisco District Award, "Silver Tambourine" several years ago for the organization of the Santa Clara County Board . 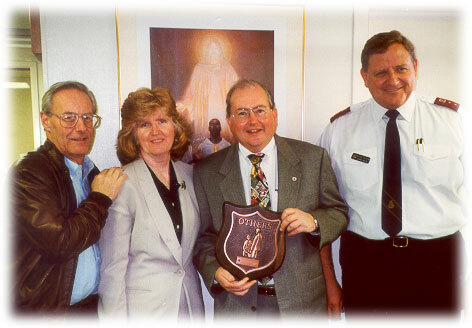 I have been active in all phases of Salvation Army work for thirty years as a volunteer. 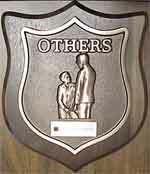 For my two year service as chairman of the San Jose Salvation Army Adult Rehabilitation Center Advisory Board, the Northern California District granted the "Others" Award. Our area takes in Santa Clara, Santa Cruz, San Benito and Monterey Counties, where we run a six month "free" rehabilitation program, solely supported by our Salvation Army Thrift Stores. I ended my term, increasing donations and sales at the thirft stores through increasing automobile donation sales, developing and maintaining www.salvationthrift.com, helping to establish the largest retail store we believe on the West Coast, activating a Speaker's Bureau program, implementing many programs along with a great board of advisors, active in the committee system to accomplish our goals. 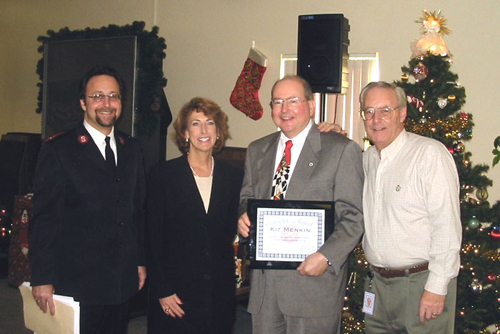 Chairman Ken Kelly, Councilman Linda LaZotte, Kit Menkin, Captain James Sloan. 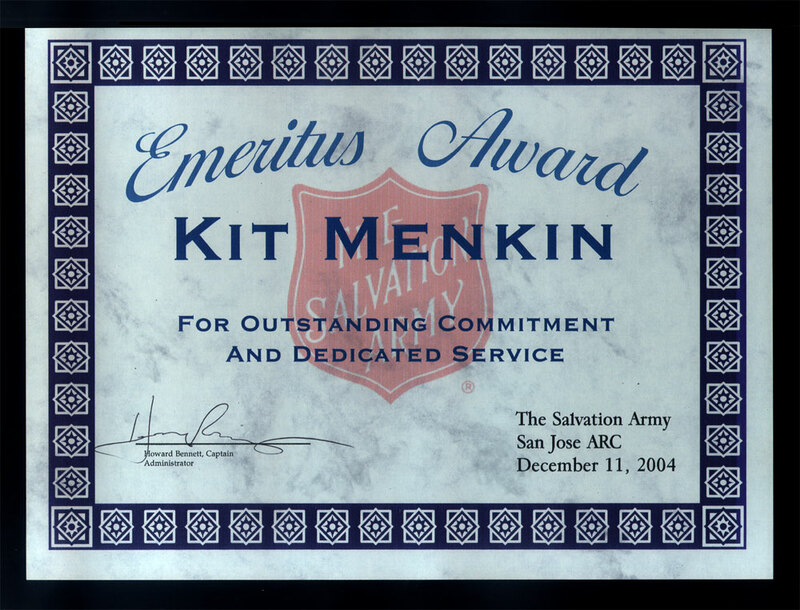 Menkin Awarded Salvation Army "Emeritas Award"
Captain Howard Bennett, Chairman and Santa Clara County Superior Court Judge Mary Jo Levinger, Kit Menkin, Past Chairman Ken Kelly. This was the first such award in the San Jose four county districts ever given. A perpetual award in his name is to be awarded for volunteer work contributed. 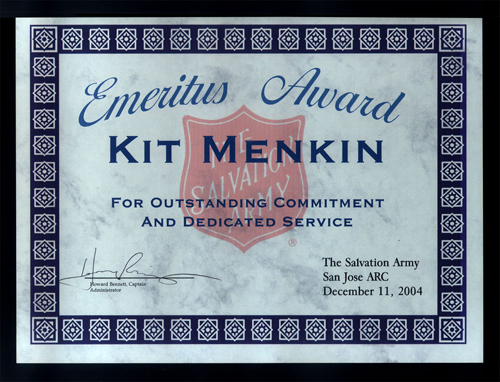 This was given for forty years of service serving as chairman, president, welfare secretary, and a list of accomplishments was read, as Kit Menkin takes his first sabbatical from the Army.